Social media’s reign as a top source of referred, inbound traffic to websites may be over, according to new research from Shareaholic. The most recent version of the rolling tracking study that measures traffic sources for more than 250,000 websites found a steep drop in visits from social media. Across more than 400 million visits, the top six search engines sent 34.8 percent of traffic. The top 13 social networks sent 25.6 percent of visitors. 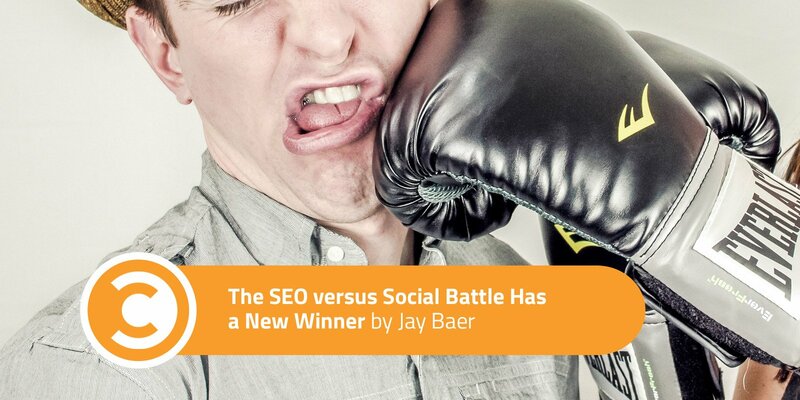 Since 2014, search has lagged behind social, but the roles have clearly reversed, and there’s a new winner in the battle between SEO and social media as a traffic source. There are, of course, many intersecting trends and tweaks at play here, but these are the three primary reasons social is dipping and search is creeping upward. Facebook, Instagram, and Twitter have all rolled out new algorithms in the past two years that fundamentally diminish exposure for company and organization content in favor of content published by individuals. This probably makes for a better, healthier stream of content, but it certainly impacts the number of clicks that social content can accrue to websites. Some of the algorithm adjustments in social media have given more reach to video content and, to some degree, photos. Simultaneously, the algorithm gives posts containing links less priority. This also has an impact on click-through traffic—so much so that our community management team at Convince & Convert is testing putting no links in social posts, but instead including links as the first comment. Search engines are doing a much better job of indexing social media content right on their SERPs, making it possible for consumers to click through from search, instead of going to a social network and clicking through from there. In the same period where Facebook referred traffic dropped 25 percent, visits coming from Google increased 21 percent. 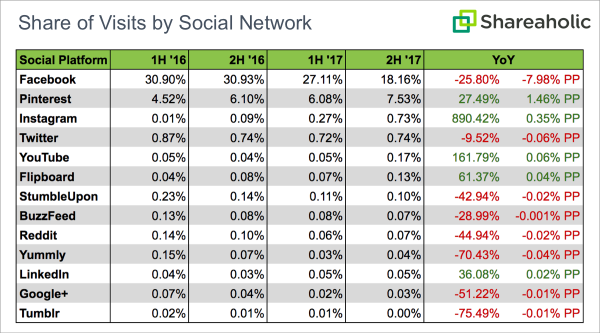 Smart marketers have paid attention to search throughout social’s rise, but this data clearly show that social’s days as the number one driver of traffic are at an end (and I don’t foresee them returning). Google is certainly working hard to stay in front, as any decline in their ability to drive traffic is almost an existential issue for them, financially. It would be wise to follow their cue and re-prioritize search in your overall digital marketing plan. Facebook, despite its steep decline as a traffic source, is still the top social referrer. But notice the huge gains made by Pinterest? It’s now a clear number two in social and drives more traffic than every other non-Facebook social network combined. In fact, according to Shareaholic’s data, Pinterest is responsible for nearly half the traffic that Facebook delivers, and among a much smaller user base. Instagram’s growth is skewed a bit due to the relatively recent addition of clickability on the platform. But the mobile photo/video platform is now tied with Twitter as a traffic source; a tremendous shift given that Instagram has historically been about “engagement” and Twitter has been thought of more as a traffic creator (in addition to its role in conversations and customer service). Certainly, LinkedIn focuses on its business audience, which makes it relevant to only a subset of the population. But the newfound emphasis on content on Linkedin makes me wonder if it will see a spike in its referred traffic in the next report, similar to what Instagram experienced in this study. For my own interactions, and the content we create here at Convince & Convert, we are putting more effort into Linkedin than ever before, pulling resources away from Facebook. This report fascinates me because it is VERY rare in business, technology, and marketing for a lost lead to be regained. Apple was nearly dead as a computer maker and was then resurrected. But Apple has never outsold Windows PCs. Once Chrome took over as the dominant web browser, Internet Explorer didn’t rally back and pull in front again. What we’re witnessing currently in the fight between SEO and social media for website traffic referral preeminence is nearly unprecedented, and it should make you reconsider how you’re allocating your resources across the full sweep of your digital marketing. If we can help, let me know.